As promised, we continue to bring you updates as they are available to us on the changes to the Early Intervention Standards in New Brunswick. When we last left off we provided the Q&A session notes that occurred from the Fredericton meeting on June 11. Since that time, the EECD has been busy putting together packages to send to parents with information about the changes and organizing public meetings in the other five regions of the province. The second meeting took place in Saint John on Tuesday June 24, and one took place on Wednesday June 25 in Moncton. There were some big developments that took place and were announced at these meetings. Previously the revised document indicated that clients needed to attend 95% of all therapy sessions (over a three month period). Both parents and agencies had numerous concerns over this. Agencies especially after it was made clear that if clients missed more than 5% of sessions for illness or reasons beyond their control parents would not be penalized with a reduction in services. Agencies were concerned because they needed to give back funds for services not provided over the 5%. Yet often workers still did prep or did overlaps with other clients, or went over programming etc, so the question became how agencies would find the money to pay staff in these cases. With funding only being provided for direct hours, this also meant there was no budget for training new staff or ongoing training – especially with the 95% attendance requirement. This will allow agencies to pay employees and to assign them to other tasks when a client is absent. However, it is still important to have a service agreement with families to outline the number of hours that they are able to accommodate. A number should be set for families – perhaps between 80-90% for attendance, and if families can’t meet that (barring exceptional circumstances), then their hours should be reduced until they were ready to show commitment. Who will be part of this stakeholder consultation? Parents, agencies and the government – yes that’s right, parents will be included! This decision was just made on Tuesday June 24, so details of what the consultation format will be, when, and who will represent each party (or how they will be picked) have yet to be announced. Between the upcoming parent meetings and other matters the minister also needs to attend to, it might take a bit of time for these details to come to fruition, but as soon as we hear, we promise to keep you informed. Agencies will still be required to record attendance in the same manner and do the paperwork at the start and end of each session as part of the overall data recording process that will be reviewed as part of the stakeholder consultation. One of the agencies had been providing occupational therapy as part of their offering and not providing 20 direct hours of therapy as outlined/required. Many of the clients the agency sees do need occupational therapy and while the agency in question will no longer be providing it, it’s also been confirmed the Regional Health Authority is not able to handle the influx of patients it is about to receive. The EECD is still working with the agency and attempting to come up with solutions. It is clear there is a need for this service and suddenly asking parents to pay out of pocket for these services is not something many of them can afford. So many of these kids are getting valuable therapy – the fact it’s going to stop suddenly and many children are going to lose out on programming and therapy from that end is really sad. I do wonder about other regions though, if there were that many children in one agency receiving therapy, I wonder whether other children in other agencies would benefit also. This seems like the government needs to step up and find more money for alternative/additional therapy. ABA is only one form of therapy and so many of our kids have other challenges and the waiting lists to get publicly funded OT are extremely long. If there is to be no wait for ABA therapy, why is it ok for there to be long waiting times for other kinds of therapy that are also needed? The goal is still to have therapy start as soon as possible; understanding that it may take some time for the agencies to staff up appropriately. So while therapy might not start as soon as there is a diagnosis, the hope is that the three-month (or sometimes longer) wait time is reduced by ensuring the first month of funding typically used to pay for assessments, is invoiced for separately and not part of the 20-hour of direct face-time budget – allowing agencies to focus on recruiting and training sooner. 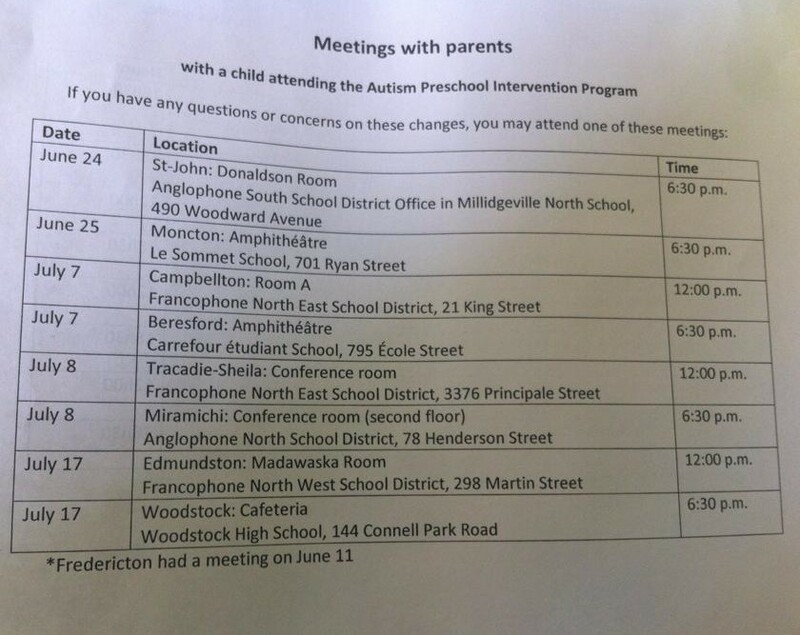 Jeff den Otter, program advisor for the EECD, who was at the Saint John meeting, said one of the things they were impressed with, was the number of suggestions coming from parents at the meeting for how the EECD can solicit feedback and better communicate with parents. Great job to those who attended, and for those who have yet to have meetings, go with your questions and (constructive) suggestions. Our voices are being heard, let’s continue banding together to ensure our children (continue to) benefit from this program. More information will be shared as it becomes available. The rest of the meeting dates are below.